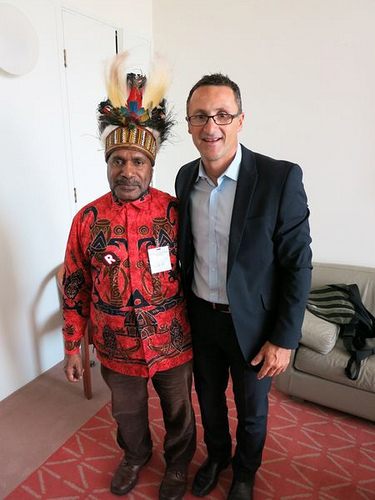 On 19th October in the Australian Senate, Leader of the Green Party, Senator Richard Di Natale put forward a motion in support of West Papuan self-determination, following the historic West Papuan People’s Petition signed by over 1.8 million people being submitted to the Untied Nations. “This is a motion that deals with the petition of the West Papuan people. Nearly two million people have come together, representing 70 per cent of the population of West Papua, despite the fact that there were threats that people who signed this petition would be arrested and tortured. “Almost two million people have signed a petition calling on the United Nations to allow a free vote for West Papuan independence. Of course, this is against the backdrop of persistent human rights abuses in West Papua. A number of people are political prisoners in West Papua, many of them having been imprisoned for many years for doing nothing other than unfurling the flag of independence. 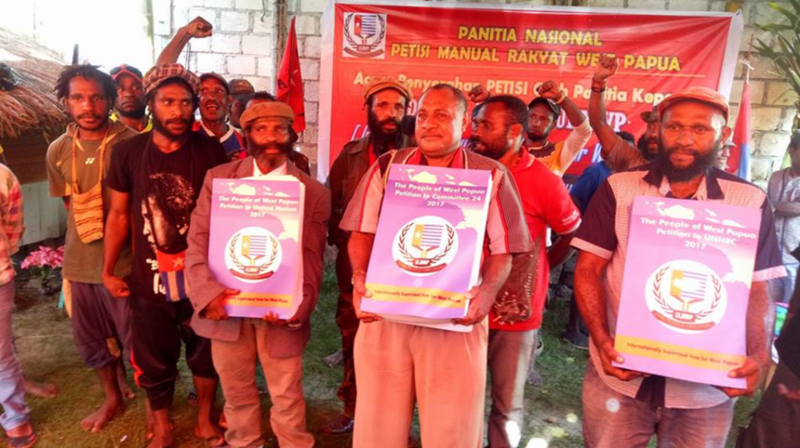 The West Papuan People’s Petition being carried by representative leaders of the Untied Liberation Movement for West Papua (ULMWP), inside West Papua. The West Papuan People’s Petition being presented to Rt. Hon. 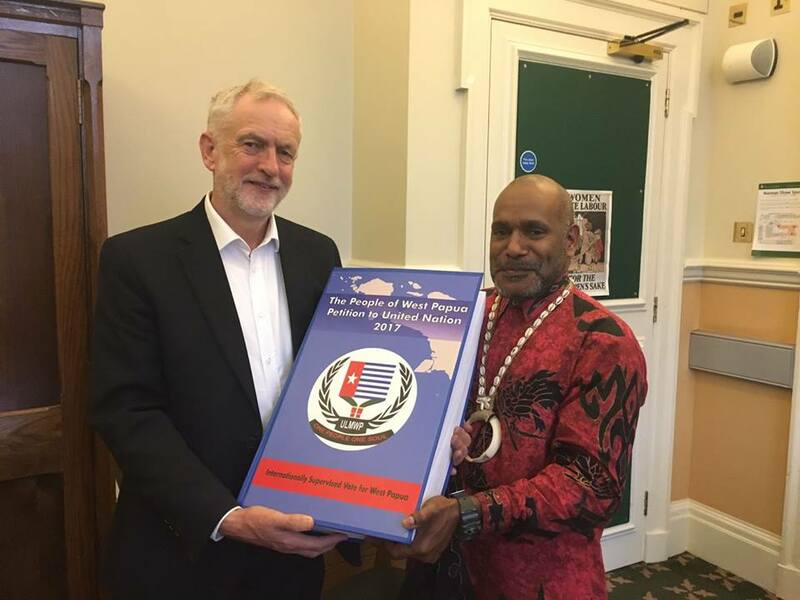 Jeremy Corbyn, leader of the United Kingdom Opposition, the Labour Party, by ULMWP Spokesperson Benny Wenda. When the Deputy President of the House asked if there was any objection to the motion being taken as formal, Senator McGrath said that there was and in doing so, prevented the Senate from from formally endorsing the motion. However, Senator Richard Di Natale was then allowed to speak about the motion. He also decried the Australian government’s “rank hypocrisy” for denying “foreign policy motions that it doesn’t like”. We are again fully grateful to Senator Richard Di Natale and the Australian Green Party for their key and consistent support for West Papuan self-determination at a grassroots and parliamentary level. People who take such actions now will be remembered in the future as being on the right side of history and as those who stood up for true moral values. With the incredible West Papuan People’s Petition being presented to the United Nations, now is the perfect time for parliaments around the world to use this evidence to support the overwhelming view of the West Papuan people towards self-determination. We encourage all parliamentarians around the world to support the West Papuan people and recognise their fundamental right to self-determination in accordance with international law. 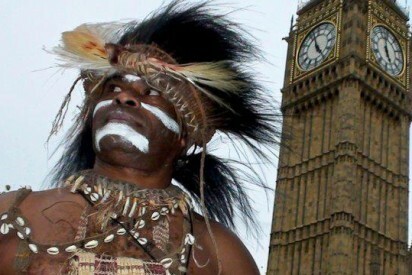 Find out more about Taking Action for West Papua by lobbying your MP and Building Political Support.